The IT Effectiveness Review assesses your ability to deliver IT support for your organization, to meet the business objectives to which you have agreed, and to fulfill your customers’ requirements. 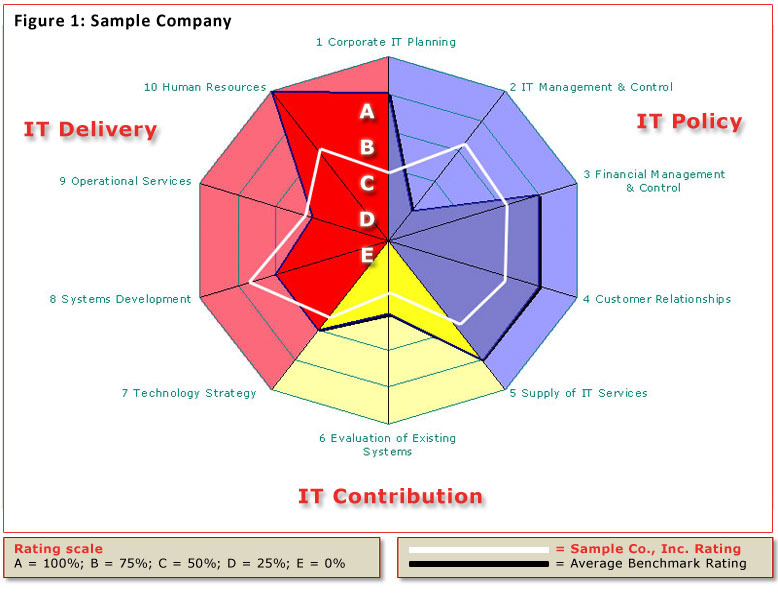 The evaluation focuses on IT policy, IT delivery and IT contribution. 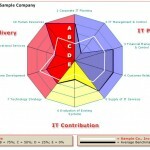 The Review examines the IT management processes and techniques you employ and compares these against a model of best practice — A model that has been refined through delivery of this review to an international sample of over 90 organizations. How your effectiveness compares with best of breed becomes the basis of a comprehensive set of recommendations. Each of these stages will involve some input from members of the client’s staff, but the Review Process has been designed specifically with a view to minimizing the amount of client time. The IT Effectiveness Review provides you with a snapshot that identifies your department’s strengths and weaknesses (see Figure 1) and makes specific recommendations for improvement. This is supported by detailed analyses of then IT management components: Corporate and IT Planning, IT Management and Control, Financial Management and Control, Customer Relationships, Supply of IT Services, Evaluation of Existing Systems, Technology Strategy, Systems Development, Operational Services, and Human Resources. TBI assigns a team of two senior consultants to each IT Effectiveness Review. One serves as the Project Manager, managing day-to-day activities and the delivery of the final report, while the other assists in conducting the interviews, assessment, and review of results. 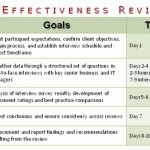 TBI offers the IT Effectiveness Review for a fee that can be discussed. Direct project related expenses, including those for travel, are charged at cost. The Review can be completed in approximately 2 weeks after contract, but may take longer, depending upon availability of client resources for planning and interview. By way of introduction, TBI is an international strategic management consulting firm with a focus on helping clients to improve their business processes through more effective use of information technology. Performance measurement, including benchmarking and customer satisfaction. With over 48 years of experience, TBI has worked with some of the largest and most demanding clients. TBI’s consultants are all seasoned professionals with many years of experience working in senior roles as managers and users of IT. While models and methodologies have their role, it is the application of these methodologies with real-world experience that benefits our clients consistently. Only practical knowledge, applied to a client’s particular needs, delivers sustained advantage. This “high-touch” consultative approach distinguishes TBI. 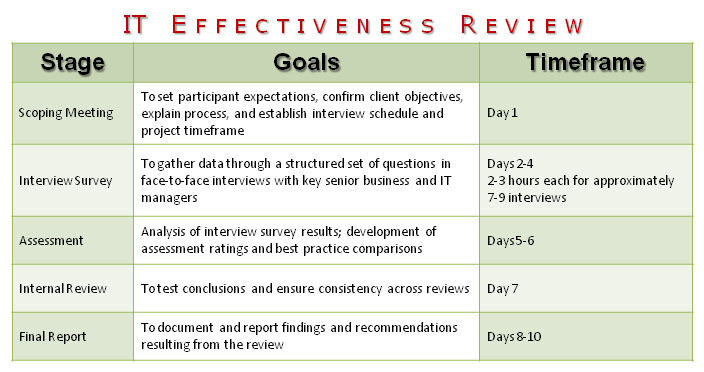 This sample report has been produced to provide examples of the style and content of the sections of an IT Effectiveness Review report. As such, it has anonymous extracts from actual reports. It is not intended that this report should be treated as a coherent whole, but as a set of samples that your IT Effectiveness Review report may cover. If this was the actually report if would be far more complex and defined. SampleCo has a reputation for excellence in its products and its place in world markets. The Information Systems Division (ISD) rightly strives to achieve the same standards. In many ways, they succeed, but the processes established and the time taken to complete those procedures and deliver systems have inhibited the ability to respond quickly to customer needs and have obscured the partnership elements essential to a successful joint service relationship. To this end, there needs to be a sustained drive to ensure alignment of ISD’s activities with on-going business needs, and to be able to demonstrate the value of these activities to the business. There is a well-established high level planning process within SampleCo, which defines objectives and strategies for the corporate body and individual business units. Because of the relative autonomy of these business units, the translation of business plans into project requirements lacks coordination and there is no comparison of relative priorities for the corporate business, which compromises the allocation for scarce resources. It is recommended that a corporate priority review body is reestablished and standard financial appraisal procedures are used to rank the value of each proposal to the business. providing joint IT and customer education and training in project methodology and project management. The means by which IT services are defined and supplied to the customers are clearly major factors in determining the effectiveness of the use of technology. Generally some mechanism which gives customers a measure of control will enhance the relationship (e.g., charging methods, service level agreements). Service is provided as a cost center, with little attention to control mechanisms. IT Costs are reallocated to the business annually in arrears. This is a straight apportionment based on usage, but which does not allow customers to appreciate or understand the cost of individual systems and services. Service level agreements are a common industry concept, but have not been implemented. Performance against any standards or targets is not measured or reported. Change management differs between each site and it appears that IT staff deals with queries and implement changes on demand, with little backlog or prioritization. Common procedures, measurement and monitoring, standards and regular reporting of performance will allow better understanding of what is done and greater customer appreciation of value for money.